I am often surprised at which combinations of animals in the sea will sit or hover together very close, coexisting, with no attempt to eat or exclude the other. 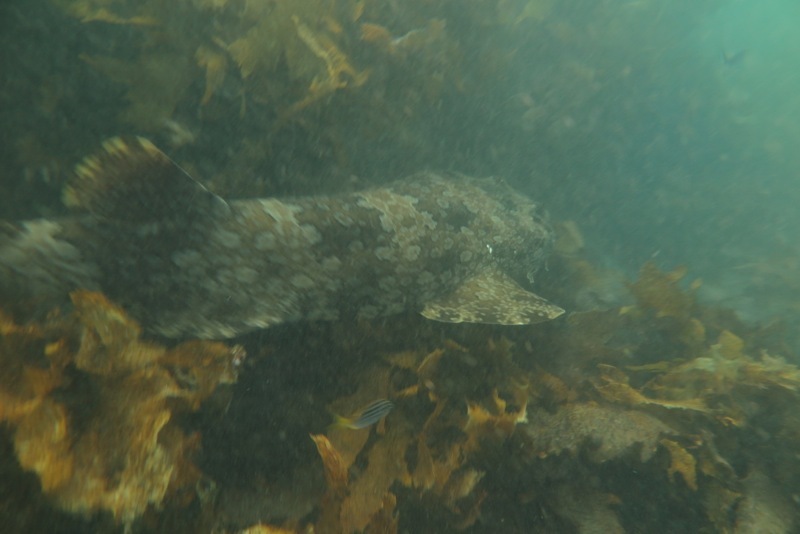 Last month I was on my way out to one of the best Giant Cuttlefish dens and I saw a Wobbegong, a kind of “carpet shark,” swimming by in the open. It wasn’t a large one, perhaps four or five feet long. 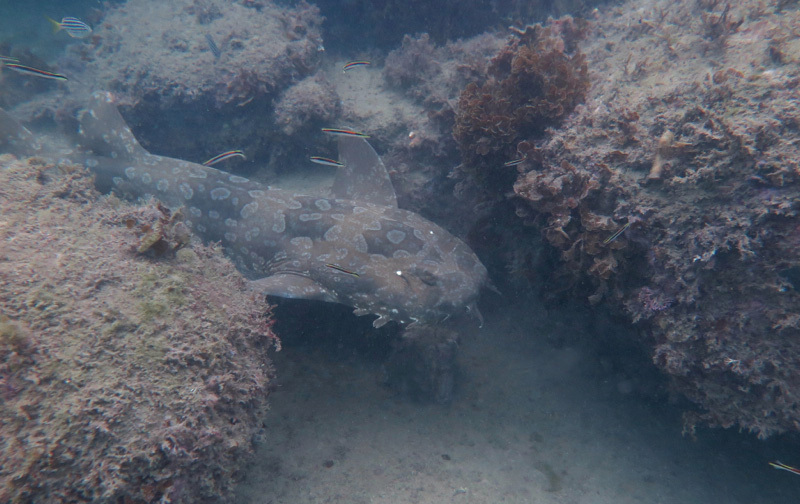 I arrived at the den and was pleased it see it was occupied, but then saw a Wobbegong, perhaps the same one, nose its way in, too. 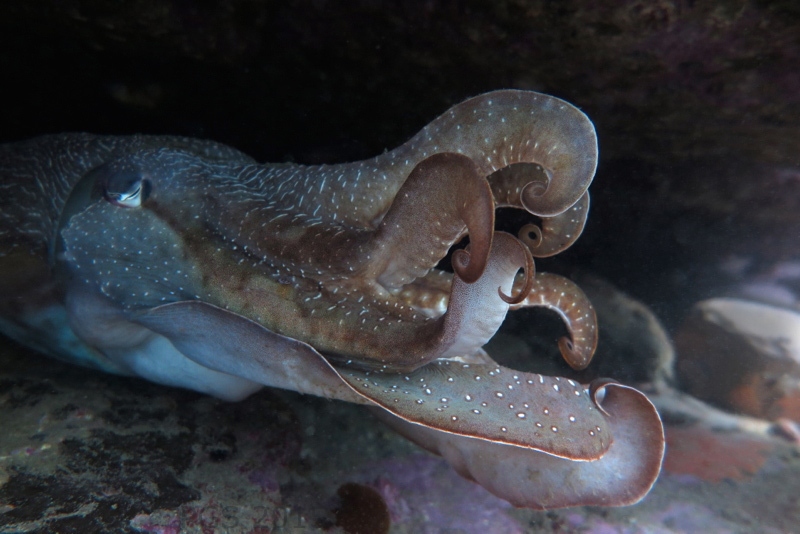 After trying a series of positions (tail in, tail out…), it took up a spot in the den quite close to the cuttlefish. 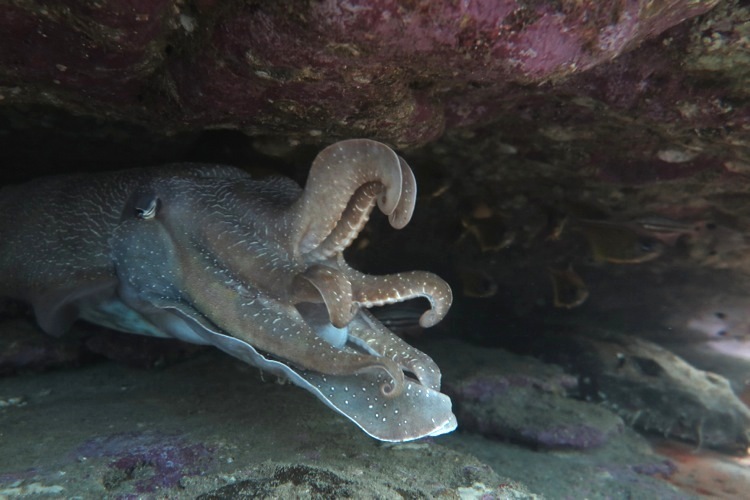 In general, Giant Cuttlefish dislike large fish in their dens; they produce dramatic displays and colors, with arms raised and curled, that seem to show their irritation. The cuttlefish, a male, began a series of these displays. What surprised me, though, was the fact he was doing it to a shark, which surely could have eaten him easily. And that is exactly what I expected to happen. But it didn’t. The shark just sat there. 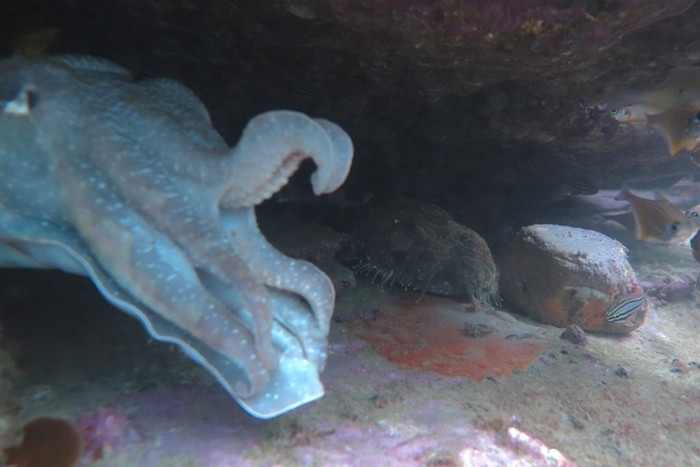 The cuttlefish continued with some displays – perhaps he felt a bit hemmed in, with me on one side and the shark on the other. But he had every opportunity to leave if he wanted, or just to go to a different part of the den. Instead he chose to stay. They sat, and the cuttlefish moved between displays and relative quietness. I went away and came back, and the scene hardly changed. They coexisted. The next day I returned to the same place. 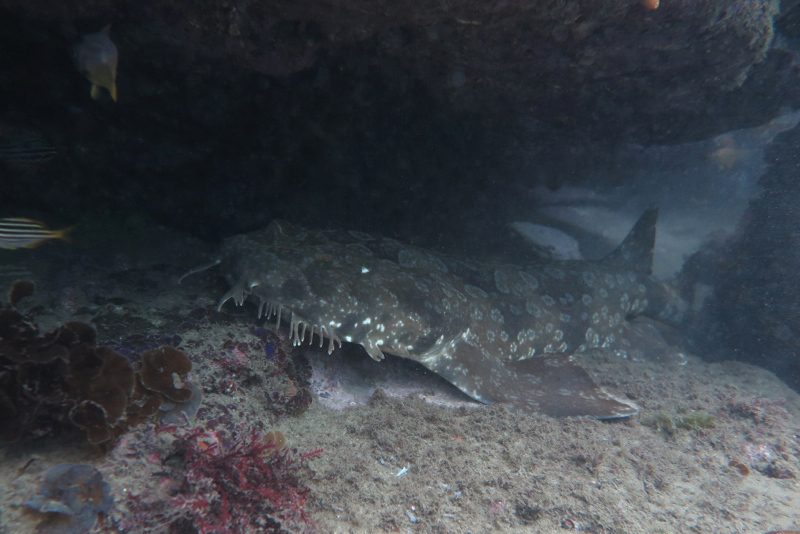 I found a Wobbegong there again – perhaps the same one from the previous day, perhaps slightly larger – lying in the same spot. And no cuttlefish. At the end of that second dive I spent some time photographing tunicates. I was trying to be very still, right up against the reef. 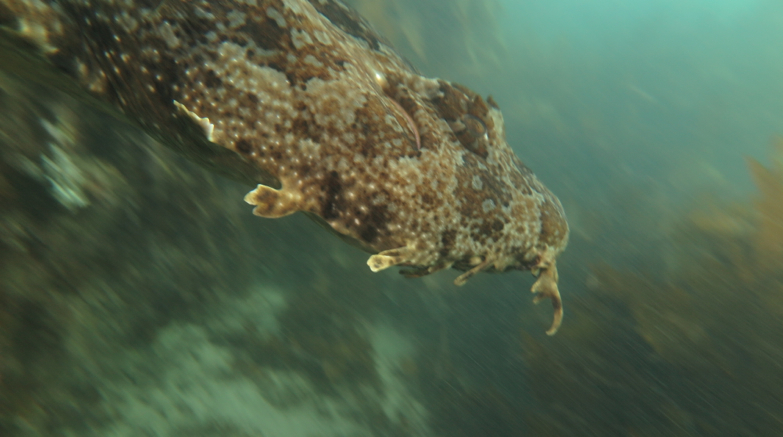 Then I found myself turning even before I knew what I was seeing, and suddenly there was a huge Wobbegong coming in. It was so close that our heads almost touched. 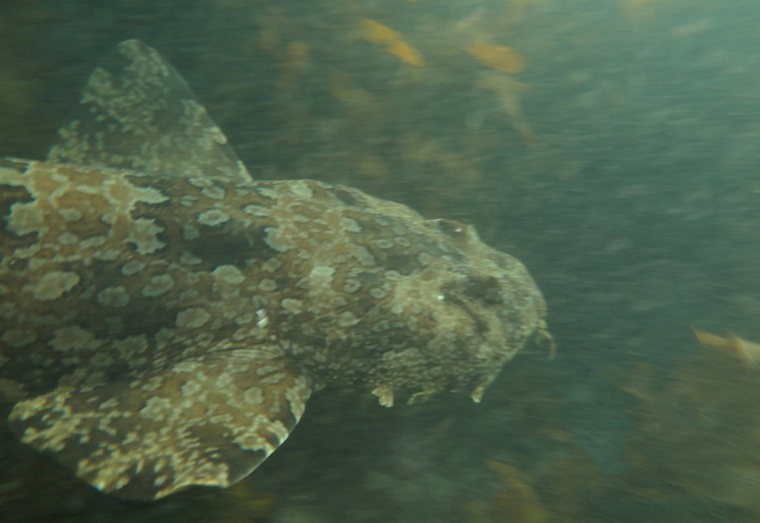 … and this photo – also a mess, in stirred-up water with the camera out of focus – shows its size as it swam by. This one was at least as big as me, probably bigger. I’ve rarely been so close to any large wild animal. It went on its way. Notes: Another interesting case of coexistence is described on my old website here. Wobbegongs are ambush predators. See here. They aren’t dangerous to humans unless provoked. 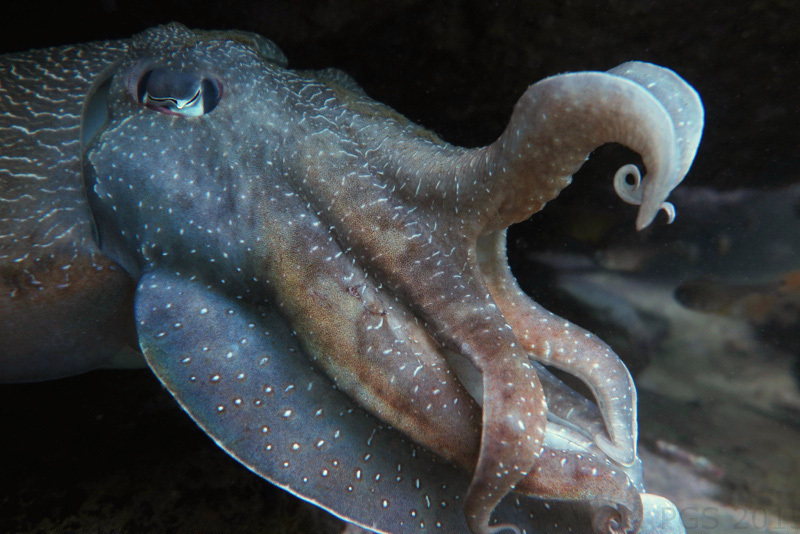 This entry was posted in Cephalopods, Vertebrates and tagged coexistence, cuttlefish, shark. Bookmark the permalink.